For me, “Upgrade” deserves the title “Best SF of the Year“. And unhesitatingly I call “A quiet place” the best horror of 2018. Even though it’s more Science-fiction than horror per se. I’ve been watching horror movies all my life and have already finished a whole list. Frankly, I was terrified of creeps like Dracula and Frankenstein until I was about 14 years old. If I even had seen a small fragment, I would go to bed shaking like a leaf and I’dd crawl behind a giant teddy bear. In my youthful fantasy, this bear was my protection against the creatures of the night. And when I saw “Evil Dead” for the first time and, to my astonishment, watched it without too many problems (as if I was numb), I knew my fear of horrors had disappeared from the face of the earth. Since then, I watch a horror with a certain kind of indifference. Last week I saw the articles about the trailer for “The Nun” and the fact they’ve removed it from YouTube after jump-scare complaints and people saying it’s too scary. At the end of the trailer, I wondered when it would start to be frightening. Well, never. But “A quiet place” … that’s a different story. You want scary? This movie is. It’s not that I broke out into cold sweat constantly or that I wet myself because of the rising tension. But I admit. At a certain moment, I sat on the edge of my seat and the tense atmosphere, in the end, made me gasp for breath. I can’t remember a film in which the constant threat and fear were so explicitly present. And the constant silence in this film is deafening. Yet a daring choice to use this necessary silence in a horror film where usually sudden loud sound effects cause a jump-scare. 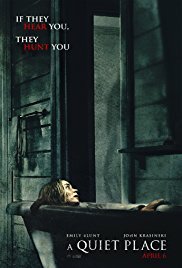 The scriptwriters of “A quiet place” didn’t have a lot of work with dialogues in this film. For the greater part of the film, they used hand gestures and occasionally they were allowed to whisper. A necessity, otherwise you won’t be having a long and prosperous life. At the start, you’re wondering (at least if you go in without any prior knowledge) why this family behaves in this way and what the result will be if they don’t stick to the imposed rules. Believe me, you will soon find out. First in a really cruel way. And then through the sporadic displaying of news articles that Lee (John Krasinski) collects. In my opinion, the things that harass this family and react to any random sound are the most frightening creatures I’ve ever seen in a film. They are as murderous and cruel as a Xenomorph from “Alien“. I looked breathlessly at the design and anatomy of these deadly creatures whose most important body organ is a freakishly large and sophisticated auditory organ. They made quite an impression on me. So fascinating. In retrospect, this film is almost perfect. On all levels. In terms of content, it’s a brilliant story. The special effects are amazingly good. The acting is sublime. Each character delivers decent acting. John Krasinski as Paterfamilias and who acts as a protector for his family. And he also (in complete silence) tries to develop a working hearing aid for his deaf daughter Regan (Millicent Simmonds). Without a doubt, the best interpretation is delivered by her. And not only because she’s actually deaf in real life and thus plays this role in a realistic way. But as part of the story, she captures the imagination the most. Emily Blunt plays the pregnant, caring mother Evelyn who’s about to give birth. A happy event that brings the necessary headaches. And lastly Noah Jupe in a perhaps smaller role as the youngest son Marcus, but still of crucial importance. And then there’s Cade Woodward. But unfortunately, his contribution was really short-lived. All of them deliver a top performance. So be warned. This brilliant film is an outright nail-biter and will make your blood run cold at certain times. And this thanks to the tight script and the scary atmosphere supported by a threatening soundtrack. Sometimes a horror cliché is used. In a world of silence, for example, an upstanding nail in the wooden cellar staircase will cause the necessary consequences of course. But that’s the only thing, in a film which excels in originality. What you do realize after watching this film, is that we humans live in an extremely noisy world. And there’s no “mute” button you can use when such creatures come to visit you. I bet it’ll be quiet subsequently. No doubt about that.